Yes, it's not an Amano wallpaper. Why? The original charater is part of the Anime "Death note"... I must honestly admit, I don't know it... I just chose the character for the reasons explained above. The background was inspired by a poster of an old movie... I only know the German title "Das Cabinet des Dr. Caligari" (1919). At the moment I am quite busy at university... so it took me... about 2 weeks to finish this wallpaper... but I did not work non stop for 2 weeks of course... I only had evening and night hours... Most time consuming was the vector of the girl... It was really exhausting... and I actually don't want to vector anything again so soon... it's the second vector I made...hopefully I improved compared to the first. OMG. I WAS BROWSING AND I WAS LIKE... WHOA. The vector just blows my mind, it's awesome! The background is great too, it's simple, but it doesn't take attention away from the vector. The perspective is great too. All in all, it's a great wall! This is so cool! I agree with you about Gothic and Gothic people. I am labeled gothic at my school and it is not because I am scary and such (besides maybe thinking scary thoughts and going to scary places such as this wall), it is just because I tend to dress gothic and I did dye my hair black. Well anyways, back to the wall, I love the colors, my fav black and red, and the background is very uniqueish (WHAT?) and cool! Great job vectoring! Wonderful Work! i had no idea your current wall was going to be Death Note. damn i must go back and read that manga [i left off at chapter 50]. Lady Regenbogen's wall: yes, i agree changing her hair to black and purple is ideal. actually i never cared for Amane Misa's blond hair. you did an excellent job vectoring AND coloring the scan. holy crap- you drew the bg with the pen tool? :drools: you did a great job. i love the bg- although i will admit I thought that was a lampost at first site. my only crit: is related more to the scan than your wall. in the original scan it seems to me that the shadows on Amane Misa's face are slightly off. :turns up "A Spy In The Cab"
I think it's a lovely piece Regen :D. You have done a tremendous job with the vectoring of the character, so congrats :D. You have also done a wonderful job of demonstrating the "friendliness" of the character, and she is very cute :D.
I have no need to look for flaws in this piece, as I find it very enjoyable, and looking for things to "fix" only detracts from that enjoyment. Well done, and keep it up XD. ...woah :D Stunning vector work! Woaahh! It's really dark! Well, not really that dark since she's smiling and all that. But ooh, this definitely is a gothic entry. The scan is definitely fitting for the theme, and Death Note... yes, the best place to find a gothic scan. Nice work. Good size, looks decent. Really nice... have a very details :) excellente! whoah ... great wallpaper. She looks beautiful yet creepy, alluring yet keep-your-distance-ish ... very lovely. I love it! Excellent wallpaper. Very well done; please keep up the good work! I see why you have vectored the scan... the colors fit a Gothic concept so much more,you have done an excellent job at that. Also very good work on detailing the dress I can only imagine how much work that was. And even though I'm not that fond of vectors without outlines this particular work makes a great exception I think it wouldn't have worked had you added them. you surely made it gothic! man! this is something i dont see everyday..
its so good! and DARK! just the way i like it! its also a good thing that u vectored it. But that's my opinion. But i'm gonna fave it cause its awesome! I like the dark tones. Beautiful Goth-like gal and really neat background. Keep up the good work. this is really good. i really like it. 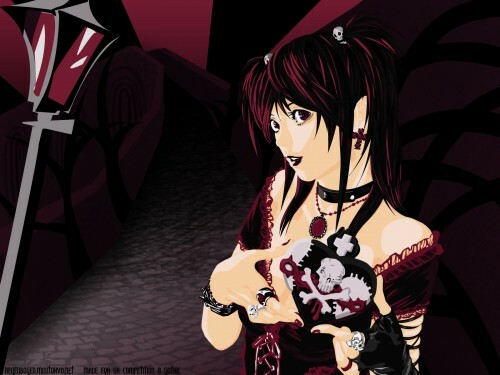 i love how Misa looks!